The rendering of the Hebrew (Num. xi. 5). 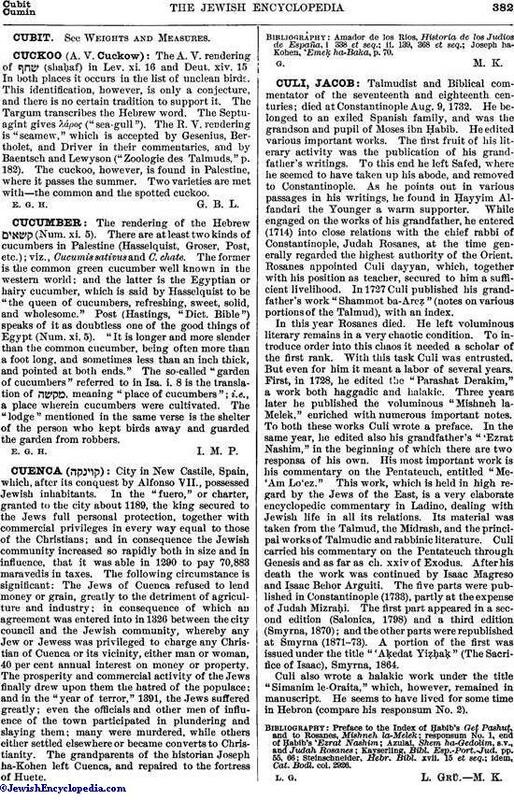 There are at least two kinds of cucumbers in Palestine (Hasselquist, Groser, Post, etc. ); viz., Cucumis sativus and C. chate. The former is the common green cucumber well known in the western world; and the latter is the Egyptian or hairy cucumber, which is said by Hasselquist to be "the queen of cucumbers, refreshing, sweet, solid, and wholesome." Post (Hastings, "Dict. Bible") speaks of it as doubtless one of the good things of Egypt (Num. xi. 5). "It is longer and more slender than the common cucumber, being often more than a foot long, and sometimes less than an inch thick, and pointed at both ends." The so-called "garden of cucumbers" referred to in Isa. i. 8 is the translation of , meaning "place of cucumbers"; i.e., a place wherein cucumbers were cultivated. The "lodge" mentioned in the same verse is the shelter of the person who kept birds away and guarded the garden from robbers. E. G. H.I. M. P.